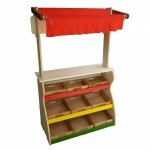 This stunning new two in one design is a children’s pretend shop & theatre / market stall and puppet theatre. This 2 in 1 child shop and theatre is an all in one space saving design so you get 2 great activity toys for one amazing price, simply change the theatre to a shop by raising up the theatre curtain with the rotating clicking dial and reversing the fabric to reveal the market stall roof and turn the item around. To make it more authentic, also included is a chalk board and a clock so kids can advertise what time Showtime will be and the shelves can be used to store puppets too. Dramatic play is an extremely valuable part of the daily curriculum.